Just when it seemed like AUD/CAD was ready to make a break for it, the barrier near the .9400 major psychological level held up strongly and kept the pair inside the descending triangle pattern on its 4-hour forex time frame. Price seems to be headed back towards the triangle resistance around the .9600 major psychological mark while stochastic is already indicating overbought conditions, which suggests that the pair could stay confined in the range. However, the 100 SMA just crossed above the longer-term 200 SMA, hinting that further upside is possible. If an upside break from the triangle takes place, AUD/CAD could climb by an additional 350 pips, which is roughly the same height as the formation. Here’s another potential triangle setup on a Loonie pair! CAD/JPY is just beginning to form a descending triangle pattern on its 1-hour forex time frame, as price is currently testing the support at the 94.50 minor psychological level. A bounce could take place since stochastic has already reached the oversold area and the 100 SMA is moving above the longer-term 200 SMA. If so, CAD/JPY could make it back to the triangle resistance near the 95.00 to 95.50 levels, which might keep gains in check. 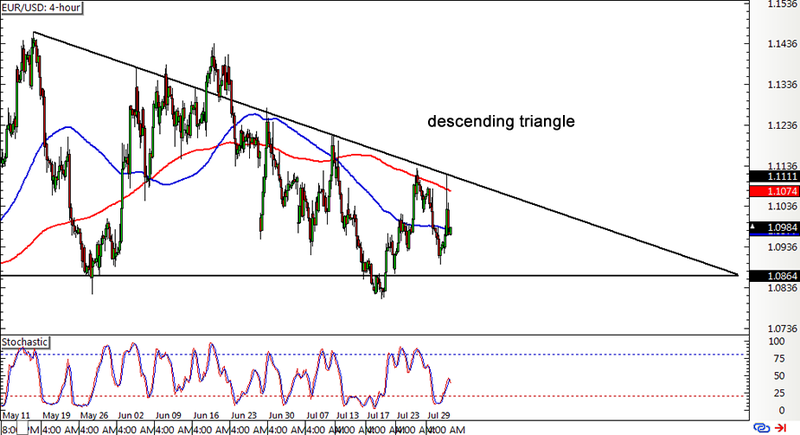 However, if Loonie bears are able to gather enough strength to push for a breakdown, the pair could fall by around 300 pips or the same size as the triangle pattern. Better review our lesson on How to Trade Breakouts if you’re waiting for one to happen! 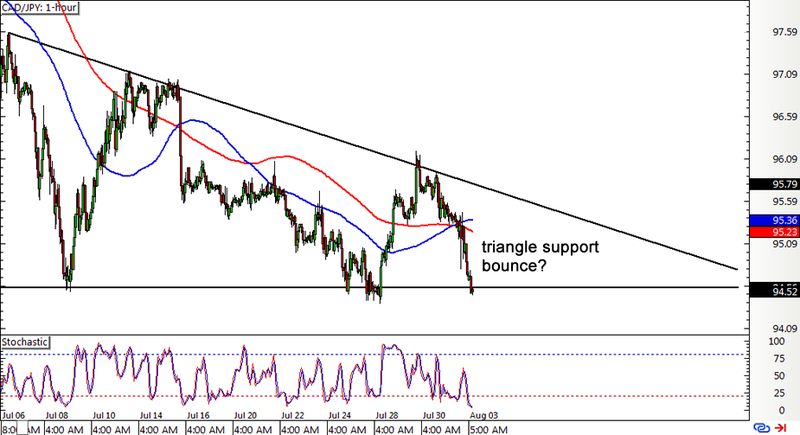 Last but certainly not least is this descending triangle formation on EUR/USD’s 4-hour forex chart. 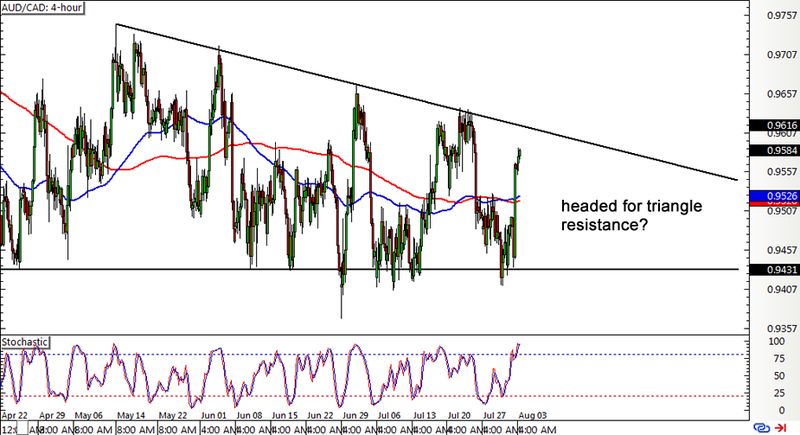 Before the pair even came close to testing the triangle support last week, price spiked up to the resistance near the 200 SMA and got rejected. Price could make its way back down to the bottom of the formation around the 1.0850 minor psychological level for an actual test of support, although stochastic seems to be suggesting that euro bulls are in control of price action for now. The 100 SMA is treading below the 200 SMA, which means that the selloff could still resume. If you’re hoping to scalp those quick bounces off the range, make sure you wait for reversal candlestick confirmation around the support and resistance areas.